Lahore: Minister for Petroleum and Natural Resources Shahid Khaqan Abbasi has said that government is very serious in resolving energy crisis which has compromised growth rate. He said that the production of electricity will exceed demand within two years while there would be no scarcity of gas which was unleash a new era of progress and prosperity. 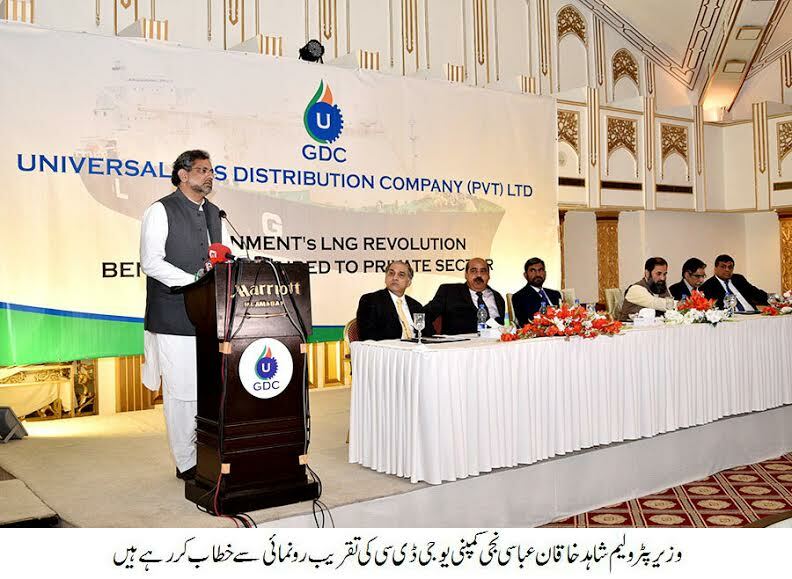 Shahid Khaqan Abbasi said this while speaking at inauguration ceremony of Universal Gas Distribution Company (UGDC) which has for the very first time in history of Pakistan obtained licence of import and market natural gas. The Minister said that gas is very important part of the nation’s energy mix which cannot be overlooked. Gas has been discovered from 71 wells during the tenure of incumbent government but it hasn’t boosted production as many gas fields depleted during the same time, he said. Shahid Khaqan Abbasi said that RLNG-based CNG would be kept well below the price of petrol otherwise the Rs450 billion industry will not survive. He said that government is very serious in containing energy crisis that’s why a private company has been awarded licence to import and market gas which will benefit consumers and bring improvement in the working of gas utilities. Last year government spent substantial amount of foreign exchange to import a million tonnes of urea while presently around 1.5million tonnes of urea is surplus in the country due to availability of gas for which credit goes to LNG, he said. He added that industry and CNG stations in Punjab are now running providing jobs to millions and revenue to the government due to availability of gas which has forced us to establish more LNG terminals and gas pipeline from Karachi to Lahore. Shahid Khaqan Abbasi said that power generation for Thar coal is matter of time while the fuel complying to euro standard will be available soon in the market which will have a very positive impact on environment and engines. Earlier, President FPCCI Raul Alam, Chairman of UGDC Brigadier Iftikhar, CEO UGDC Ghiyas Paracha, President Petroleum Dealers Association Abdul Sami Khan and others lauded the selfless efforts of petroleum minister to improve energy situation in the country. They said that they are satisfied with the performance of the government and will extend all out cooperation to settle energy crisis which has become a threat to the economic revival. The speakers demanded establishment of LNG terminals and gas pipelines on fast track saying that involving private sector in the gas business will have a very positive impact on the overall situation.